This couscous salad is inspired by North African cuisine, where these tiny grains are a staple ingredient. This salad is full of fresh vegetables and earthy spices! I have really terrible eating habits. Especially for someone whose career revolves around food. I write about food almost every day. 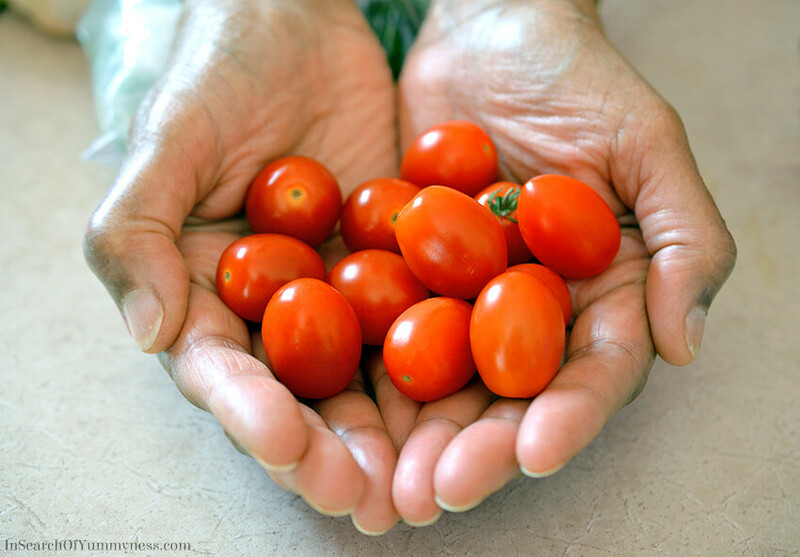 I take photos of food, I style food, I develop recipes and share information about food. Yet, I struggle with eating properly. When I wake up in the morning, the first thing I do is turn on my computer. I always intend to skim my Facebook feed and emails before I eat breakfast, but I end up sitting there for at least an hour. Then when I finally get up to eat, I grab a bowl of cereal, or a yogurt cup, and head back to my computer. I often forget to eat lunch too… This usually results in me either snacking on junk before dinner, or eating way too much dinner, to compensate for the fact that I’ve basically starved myself all day. Acknowledging a problem is the first step to overcoming it, right? My first step in fixing this problem is to make better food choices. For me, this means adding more fruits and veggies to my diet. I’m not about to start cutting carbs (so not happening! ), but eating more produce is never a bad idea. To get started, I visited my great-aunt and asked her to share her couscous salad recipe with me. It’s loaded with fresh raw vegetables, so I thought this would be a great place to start in my quest to eat better. The flavours in this recipe are loosely inspired by North African cuisine, where couscous is an important ingredient. Spices like cumin, cinnamon and paprika are often used in North African cooking, along with olives, fresh herbs and vegetables. While the turmeric isn’t an African ingredient, it adds a beautiful yellow colour to the couscous, and it’s supposed to be very healthy for you too. I admit that this salad does require a lot of ingredients, and a lot of prep, which are two things that I generally avoid. The nice thing is that you can do a lot of the prep work ahead of time, and then just throw the salad together when you’re ready to eat. If you’ve never cooked couscous before, you’re in for a pleasant surprise. Couscous, which is steamed and dried durum wheat semolina granules, is extremely easy to cook. All you need is a kettle, a bowl and a plate! I mean you can make it in a pot too, but I like the bowl method best so that’s what I used in this recipe. Couscous has a neutral flavour, so you can use it in both sweet and savoury preparations. It will take on the flavour of whatever you mix it with, too. I usually buy the Casbah brand from Walmart, but you can find it at most grocery stores (it’s usually in the aisle with rice). 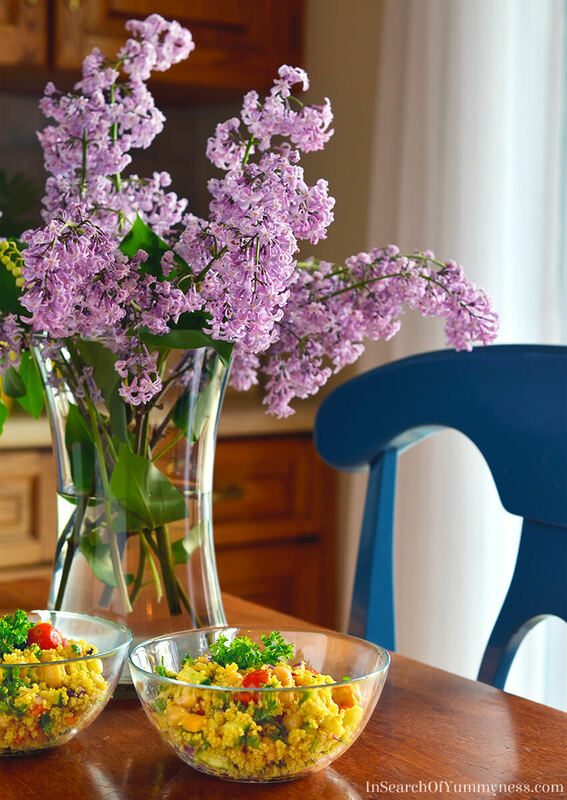 You can use either original or whole wheat couscous for this recipe – I just used whole wheat to make this salad more nutritious. Previously, the only couscous dish I would make was one with lemon, red chile and parsley from Jamie Oliver’s Meal in Minutes cookbook. I had otherwise written couscous off as too bland, and never really experimented with it. This couscous salad is definitely not bland! First, the couscous is cooked with salt, black pepper, cinnamon and turmeric. This creates a flavourful base for the salad. Then all those vibrant diced vegetables get a burst of fresh green flavour from parsley. But the real showstopper is the garlicky, tangy dressing with smoked paprika and cumin. The bracing acidity and bold garlic flavour is what makes this salad interesting. It does take a few minutes to make, but you could always make it ahead of time and store it in an airtight jar in your fridge for later. You can be flexible with the vegetables if you want to. Feel free to replace black olives with green ones, use only one type of bell pepper, chop up a large tomato instead of using cherry tomatoes. Whatever works for you! I used curly parsley, but you can use flat-leaf instead if you prefer. Although curly parsley is actually nice to eat if you chop it really finely. Some people recommend squeezing out the excess chlorophyll from curly parsley before eating it, which also helps. You just rinse the parsley under cold water, then give it a few good squeezes between sheets of paper towel before chopping it up. 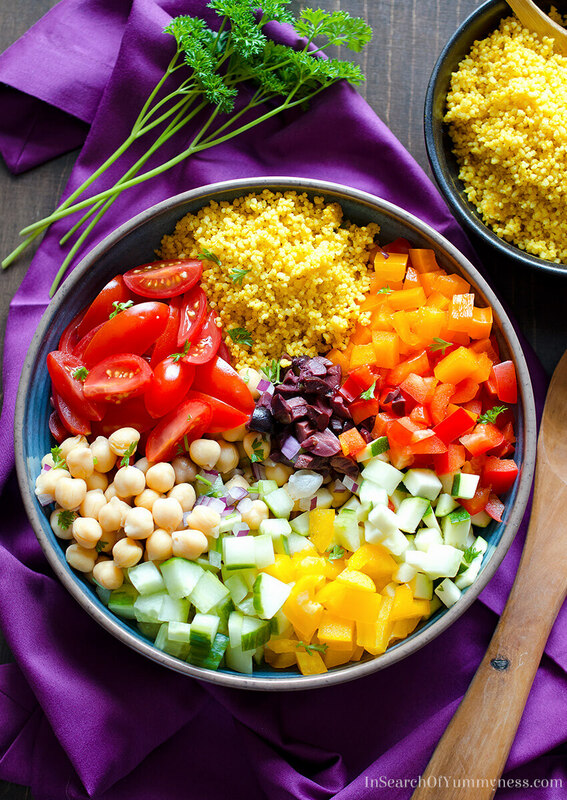 This couscous salad is perfect for summer, because you don’t need to turn your stove on to make it! Just pour 1 cup of couscous into a bowl, top with 1 cup of boiling water, cover with a plate of a pot lid, and allow to sit for 5-10 minutes (until the water is absorbed). That’s it! If you have your ingredients pre-chopped, and your dressing already mixed, it can be a fast weeknight dinner. You could even add chopped leftover chicken to make it more filling. You could make this the night before to take to work for lunch, but I wouldn’t leave it for more than 24 hours, because the vegetables lose their satisfying crunch. 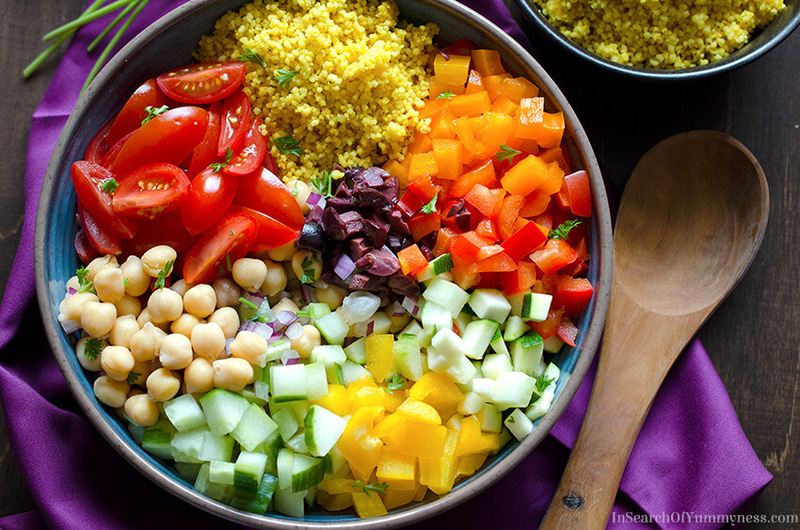 This couscous salad is loaded with fresh raw vegetables! The tangy, garlicky, spiced dressing is what makes this salad delicious! Pour couscous in a large bowl. Add salt, black pepper, cinnamon and turmeric. Stir to combine. Pour in boiling water, stir, then cover tightly with a pot lid or plate. Let stand for 5-10 minutes, or until water has been absorbed. When done cooking, fluffy with a fork and set aside. Whisk together all ingredients in a small bowl, then adjust seasoning if needed. Set aside. Add chickpeas, vegetables and cranberries to the cooked couscous. Stir to combine. Stir in chopped parsley and serve. Don't use all of the dressing at once. Add some dressing, and taste your salad, then add more as needed. I use all of the dressing, but you may find that it's too strongly flavoured for you. It's very garlicky! 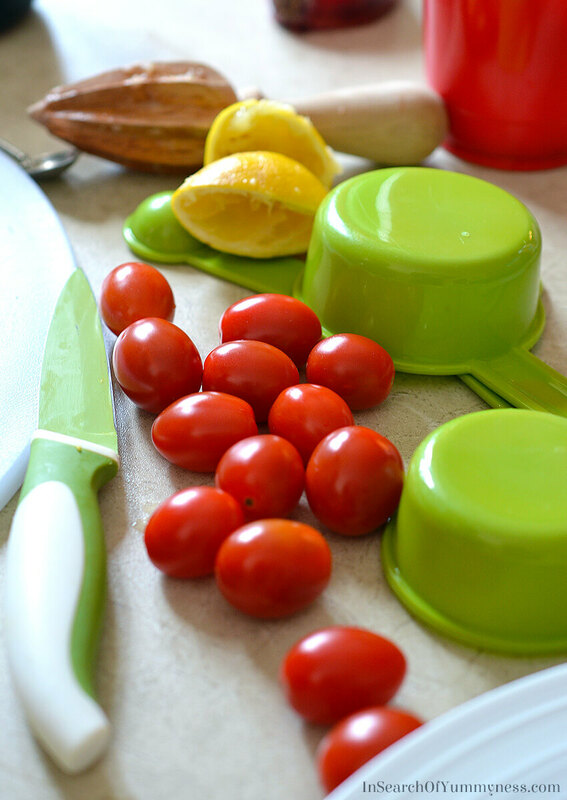 Chop your ingredients, make the dressing, and store in the fridge until ready to eat. Then simply cook the couscous, and combine your prepared ingredients for a quick weeknight dinner. Refrigerate immediately, eat within 24 hours for best texture. Please note that the nutritional information for this recipe is only an estimate, and has been calculated using a plugin. Share Your Version On Instagram!Mention @InSearchOfYummyness or tag #InSearchOfYummyness! Grain salads are such a great way to work variety into your daily menu. Your great-aunt’s version sounds delicious. It uses a great combination of spices. Smoked paprika alone is like a secret weapon in the kitchen! To be honest, I was a little worried about the cinnamon in there. But it totally works! I love smoked paprika too, especially with chicken! Admittedly, i am also often a meal skipper. Ensuring all meals are accounted for is still a work in progress. Dishes like these that are great to quickly make and have ready for those times when you knowingly will get caught up in an activity. It’s definitely important to plan ahead for those busy times! I need to get better at that. I desperately need good summer salad recipes like this one! I love meals you can prep ahead and eat for a few days afterwards but a cold salad is even better in this heat. I really like how the couscous is spiced and flavoured before you even add the dressing, no more bland couscous! Do you think maple syrup would be a good sub for honey, or should I go with a less distinctly flavoured sweetener? I think maple syrup might be too strongly flavoured. What about agave? That might work better, or you could try brown sugar. I love cous cous and I make it often but always with roasted vegetables, never like a salad and now you inspired me to try it. Like the cinnamon and paprika added to the cous cous while it’s cooking! Beautiful pictures too! Thanks! I haven’t tried making it with roasted veg, but that sounds like a good idea! This is definitely my type of salad! I’ve never made it with turmeric however, I can’t wait to try your version. Thanks for sharing this great recipe! This looks delicious! I love that the couscous is cooked with spices and all the spices in the dressing. I honestly haven’t had couscous in such a long time, I usually sub quinoa or millet, as they have a little more flavour, but I forgot how great it is for letting other flavours come through. Looking forward to trying your recipe! 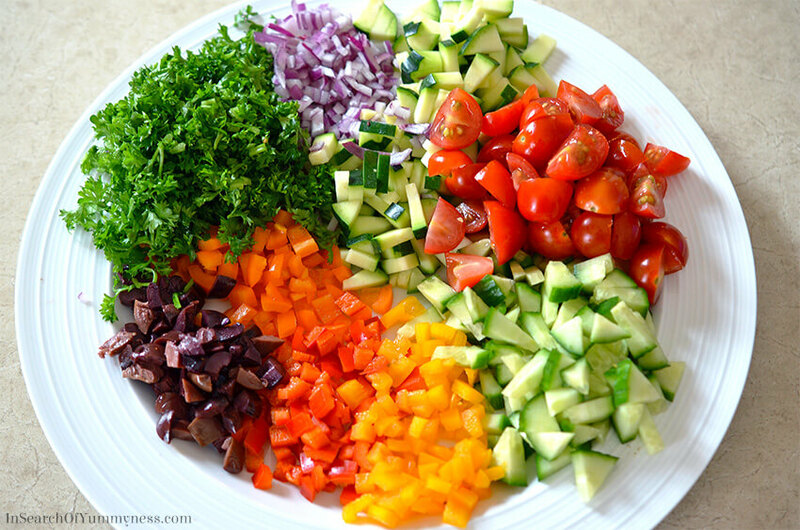 This salad is so gorgeous, it just makes me happy to look at it! Hey, I'm Shareba. Welcome to In Search Of Yummy-ness, an online publication with stories, interviews, and recipes that celebrate a variety of international cuisines.